This is a cape designed for friends elves minifigs. It is an ideal replacement for the 26486 cape made by Lego. Below is a Aira Windwhistler minifigure modelling a violet version along side the Naida Riverheart minifigure modelling the Aqua version. Please note these are in polycotton and not the spongy stretchable fabric that Lego use. This is a cape designed for friends minifigs. It is an ideal replacement for the 21497 cape made by Lego. Our Cadbury Purple is the best for the Skyra character. 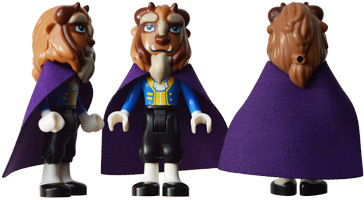 Below is a minfigure modelling both the main cape (Cadbury Purple version) and a white collar (which is purchased seperately below). This is a cape designed for friends minifigs. It is an ideal replacement for the 21503 cape made by Lego. Our White is the best for the Skyra character. Below is a minfigure modelling both the collar cape and the main cape (which is purchased seperately above). This is a cape designed for friends minifigs. It is an ideal replacement for the 21490 cape made by Lego. The minifigs below are modelling the CadburyPurple, CornflowerBlue and Pink versions. This is a cape designed for friends minifigs. It is an ideal replacement for the 21008 cape made by Lego. The minifig below is modelling the Pink version. This is a cape designed for any friends minifigs although it is an ideal replacement for the Beast minifigure ie the 26584 cape made by Lego. The minifig below is modelling the CadburyPurple version. This is a cape designed for friends minifigs. It is an ideal replacement for the 20374 cape made by Lego.